The developer of a very successful iPad app told about the absurd steps he and his team went through to get an iPad before the product’s launch. Now that it’s over a year, I can talk about it. I was probably the sixth person to get an iPad. We got two of them flown out. The criteria was that we had to have a room with no windows. They changed the locks on the door. Three developers and I were the only people allowed to go in the room. Apple needed the names and social security numbers of the people who had access. Apple needed to be able to drill a hole in the desk and chain the devices to desk. They used those bicycle cables. They had these custom frames built around them so we couldn’t even tell what the iPads looked like. We could plug into them so we could code to them and we could touch the screen and play with that, but we couldn’t see the form factor. Then they took pictures of the wood grain. If any pictures leaked out, they could trace it back to which desk they came from. I hadn’t thought about that but she was probably right. Luckily, it worked out very well. 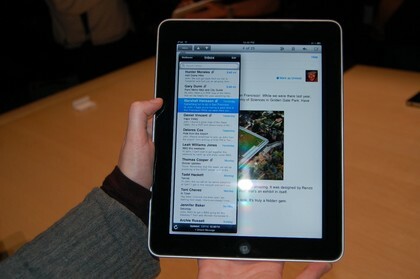 » WTF: How do I insert a CD to the iPad 2?